The first rule of Book Club is: you do not talk about Book Club. The second rule of Book Club is: you DO NOT talk about Book Club! Kidding. The only rule of Book Club is: DO IT! The book club vs. literature circle debate is ongoing, but I differentiate the two concepts with the degree of student-directedness vs. teacher-directedness. 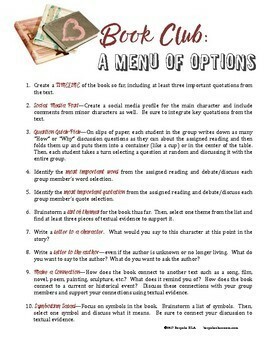 The book club concept gives students more control over their own book study instead of being teacher-directed like literature circles. Don’t get me wrong. I think both are important tools for the ELA classroom. Students need the teacher-directed training of literature circles so that they know how to function in a book club group. Scaffolding is necessary. But once students have shown the ability to be more independent, book club can take students one step further—taking ownership of their learning. But what exactly are students supposed to do in their book club groups when they meet? 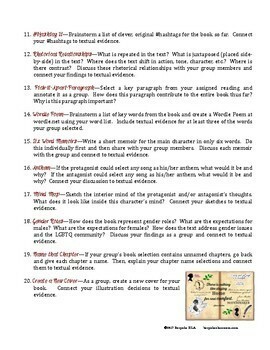 They might need more options and more guidelines other than “Discuss the book.” Giving students options broadens their horizons of possibilities and helps them to think outside the “quote log” discussion box. 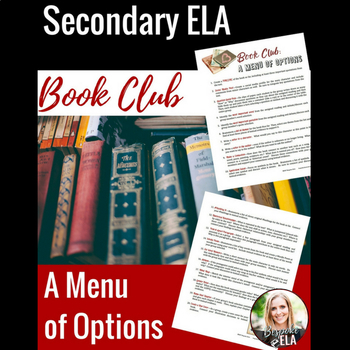 In this product by Bespoke ELA, you will find a menu of book club options for secondary book club groups. Students can use this menu of options as a springboard for their discussions. This is an excellent addition to any literary unit of study! Visit the blog at BespokeClassroom.com for more ideas!